You should be redirected automatically in a few moments, but if not, please click here to see if The future and the Futurist has made the transition. And so the Futurist cinema is coming down. It’s been on the cards for a few months, and now people are generally coming to the opinion that it was inevitable (for which read ‘the Council pretended it wouldn’t be demolished, but always intended to demolish it anyway’). But I’m not here to debate conspiracies, because you get nowhere, and what’s done is done (by the time you read this). I’m interested in the arguments which have grown up around these events on Facebook and Twitter. There are, naturally, many many people who are saddened by the destruction of a beautiful building, and there are more who are dismayed at the unfulfilled promises of keeping the façade intact. And then there are those who are encouraging us to ‘crack on’ (Joe Anderson, that one) and to ‘quit living in the past’. For them, the Futurist was a building that has come to the end of its life. It was falling down, no one had found a need for it, and it is high time someone put something useful there. Both these sides of the argument can be understood, but I think they’re missing the point. Of course, people have memories associated with old buildings (especially social places like cinemas), and for that reason they want to keep them around, like a keepsake. And of course, that’s the easiest argument to dismiss – we can’t just keep accumulating old stuff because we can’t bear to part with the memories. But even if we free ourselves from the need to accumulate old stuff, we can’t escape the fact that old stuff does accumulate. It’s there all around us, and not just in the form of old buildings that are derelict or in use. The street layout itself is a product of history, of events, practices and goings-on. St George’s Hall is on a perfect spot to welcome visitors into the city from the station, but it was built at a time before that kind of consideration was made, and it was a plot freed up by the demolition of the first Liverpool Infirmary in 1824. Such is the luck and serendipity of these things, and now we have a brilliant plateau of architectural gems at the gateway to the city. We are gifted our historic landscape by the people who came before us. Through action, inaction, use and disuse, we are left with a collection of buildings which we must decide how to use. Old buildings are never demolished purely because they are old, and new buildings are not thrown up just because the previous lot are past some sell by date. 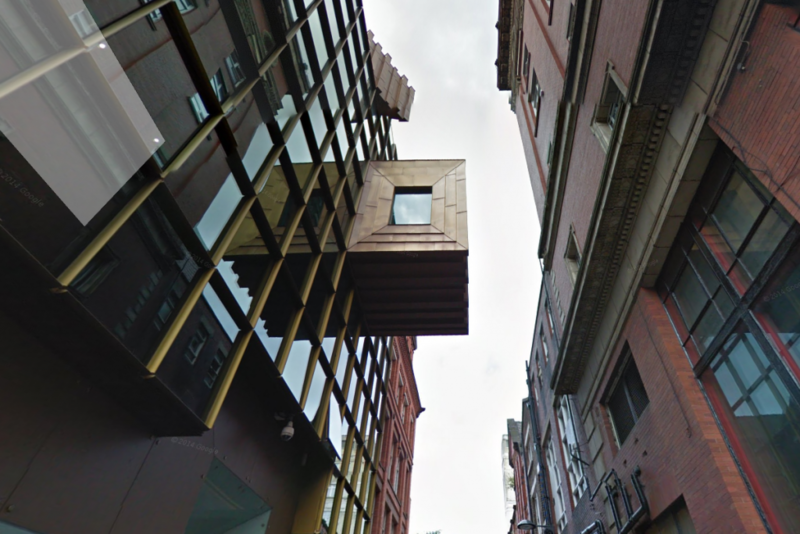 And so it follows that every new building to be built, and every existing one to remove, must be considered carefully. We need to keep the best of the old, and pass it all on, while making way for the new where appropriate. It’s all about checks and balances, and curating a collection of buildings and streetscapes which are the best they can be, incorporating both new and old. What do we want? Great buildings! When do we want them? Now, and in the future! At the Pier Head, both the set of Mann Island buildings and the new Museum of Liverpool (and the ferry terminal) came in for criticism. Again, people were accused of being anti-new. Did you know that “They” complained when the Liver Building was erected? In a few years you’ll love the black blocks! But it was clear that the Mann Island development got (and still gets) the most scorn poured onto it. The Museum of Liverpool building has its critics, but isn’t usually seen in such a negative light. I believe this is because the Mann Island buildings lack character: they have no external detail, they don’t vary, and their black colour is already broken by residents’ very reasonable practice of opening windows and blinds at different times. They are buildings which don’t respond well to real life, in the way that real life actually happens. The museum is better: it’s more interesting without being a gaudy design; it has texture on it and the eye is drawn across the surface as you look at it. The ferry terminal is basically what a five year old draws when they’re ‘inventing’ a car, or a wardrobe with crayon. Liverpool has been called a city of radicals, and its social and political outlook is forward-looking. But it also holds its history dear, and with good reason. The people of Liverpool value the interest and layered meaning that all those centuries of history lay down. We still have statues of chained slaves, and the International Museum of Slavery, which shows that we’re not shy of the darker periods of our past. We have St George’s Hall Courts and cells, and we preserve that other court – the court house – as a valuable reminder of how far we’ve come. We don’t hide from the past. As a modern city, we pride ourselves at how enjoyable it is to simply walk around the city, whether that’s the centre, the suburbs or the parks, or even taking a ferry across the Mersey. Liverpool is a brilliant place to simply be in. 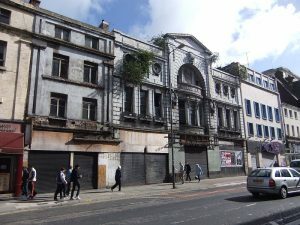 And so when we’re faced with a carbuncle, or a row of blocks in place of a much-loved cinema and varied (if dilapidated) shop fronts, don’t be surprised if people put up a fight. And don’t argue that we must move on, because keeping historic buildings is moving on, and taking those buildings with us into the future. Sure, we can’t save every old building, but we should do our best to save every interesting building, however old. And when the public start to feel like the wool has been pulled over their eyes by those they suspect have something to gain, then the problems deepen. The plan now is to ‘depict’ the Futurist cinema on the front surface of the new development. So even now there’s an admission that the old building is superior in appearance to the new plans.